It's all about entering the spaces I have created in these paintings and absorbing the atmosphere in there. Mass media advertising has a tendency to skew our priorities. It has us yearning for the unattainable, it glamourizes exotic locations by only showing them in perfect weather conditions. It convinces us that owning a luxury SUV will transform our driving experiences regardless of our congested roads. And here, art can act as a corrective to our skewed values. In 1503, Albrecht Durer asked us to have some appreciation for some grass. Thanks to advertising, what we call glamour is so often located in unhelpful places: in what is rare, remote, costly or famous. And yet, the artist Chardin asks us to consider the value of a modest moment in a domestic setting. 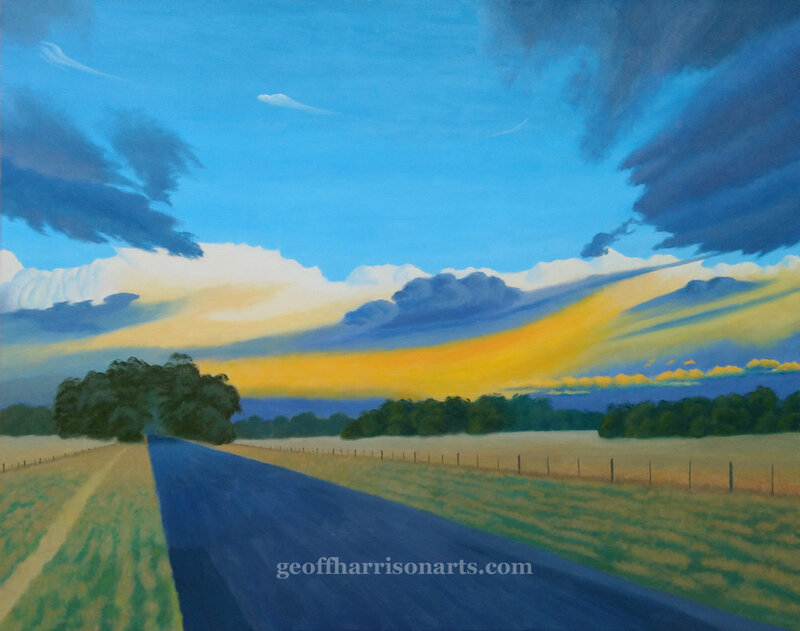 Art can teach us the value of a walk down a quiet country road during a stormy evening where we can contrast the peace of a rural setting with the drama taking place overhead. It’s unlikely a travel brochure would wax lyrical about the frozen north, but I would argue that when the ice and snow has melted during the arctic (and Antarctic) summers, these regions have their own unique beauty. De Botton argues that it lies in the power of art to honour the elusive but real value of ordinary life. It may teach us to be more just towards ourselves as we endeavour to make the best of our circumstances. In comparing the works of Richard Serra and Anish Kapoor (now Sir Anish Kapoor CBE RA), it strikes me that in terms of motivations they could have come from different planets. 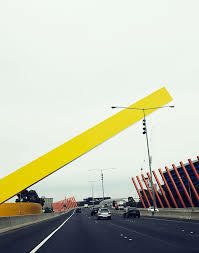 I was thinking of this the other day whilst travelling on Melbourne’s City Link towards the Bolte Bridge, with that hideous yellow chopper leaning menacingly over the road. As far as I’m concerned, this sculpture serves the cause of art in this country no favours at all. There’s a long tradition in this kind of alienating sculpture. For decades the American, Richard Serra has specialized in huge sculptures of steel which, should they collapse, would squash you like a bug. But so what? In her book “The Re-enchantment Of Art”, Suzi Gablik argues “we no longer need old authoritarian ideologies which demand that art be difficult, willfully inaccessible and disturbing to the audience.” Modernism’s general themes seem to be alienation and displeasure with society, and the heroic and belligerent ego cut off from the social world. She cites the example of Richard Serra’s ‘Tilted Arc’ installed at the Federal Plaza in Manhattan in 1981. The 120 ft long, 73 ton leaning curve of steel could be considered the “epitome of uncompromising, modernist art.” GABLICK. Some critics thought its willingness to confront the audience gave the work its moral dimension. But the public hated it. One employee at the plaza said it dampened our spirits every day….a hulk of rusty steel…and has no appeal. A petition signed by 1300 employees in 1985 asked for its removal. Serra sued the government who wanted to remove the sculpture claiming the government had “deliberately induced” public hostility to it. The notion of artistic freedom is raised here. But freedom in this issue could be interpreted as the power of having one’s way, pushing things around and being invulnerable. Serra lost the case and in March 1989 the sculpture was finally removed from the plaza and taken off to storage in Brooklyn. It hasn’t been publicly displayed since, in deference to the artist’s wishes. Gablik asks whether the aesthetic value of an artwork can be sustained without responsibility to the social feedback it receives. Anish Kapoor has different ideals. In 2006, Kapoor installed “Cloud Gate” at the Millennium Park in Chicago to general acclaim. It’s approximately 20 metres long and finished in seamless polished chrome. The city didn’t know how to budget for it. They initially set aside $9 million, but it cost $23 million – but hey, this is Chicago we are talking about. A budget has also been set aside for daily cleaning. The public adore it, they have found the work engaging, beguiling and it has become a popular meeting place. Kapoor believes the idea that one is involved is fundamental to sculpture. He likes to take the viewer on a journey into a sculpture. His work engages the eyes, the nerves, the emotions. You seem to be on the edge of being outside and inside the work. His breakthrough was being Britain’s representative at the Venice Biennale in 1990. In 2012 the art journal Triple Canopy published a treatise on IAE (International Art English) written by Alix Rule and David Levine. We are told the international art world relies on a unique language. And by the art world, what is meant is not just artists and curators, but gallery owners and directors, bloggers, magazine editors and writers, publicists, collectors, advisers, interns, art-history professors, and so on. The growth in IAE in recent times seems to be inextricably linked to the Internet and the biennale as artists, gallerists and others strive to reach an international audience. And this brings me to e-flux, described by Rule and Levine as the art world’s flagship digital institution. “Essentially, e-flux is a listserv that sends out three announcements per day about contemporary art events world-wide.” Unlike similar services, e-flux is curated. And because e-flux press releases are implicitly addressed to the art world’s most important figures, they are written exclusively in IAE. Rule and Levine collated thousands of exhibition announcements published since 1999 by e-flux and then used some language-analysing software called ‘sketch engine’ to discover what, if anything, “lay behind IAE's great clouds of verbiage.” In 2012, e-flux had twice as many subscribers as Artforum. IAE also loves lists “forms of practice, techniques, formats and aesthetics … not dissimilar to the functions of the concepts of the filmic or the literary that entail activities such as organization, compilation, display, presentation, mediation or publication ….”. I’ve also encountered the extravagant use of lists in job descriptions. Rule and Devine end up asking how, when we write about art, did we end up writing in a way that sounds like inexpertly translated French? They argue the origins can be traced back to an art journal called October founded in New York in 1976, whose editors sought a more rigorous interpretive criteria for art criticism than was common at that time . They looked to the French post-structualist philosophers for inspiration. They quote expressions such as “the political," “the space of absence,” “the recognizable and the repulsive”. IAE’s role in a much expanded art world was to consecrate certain artworks as significant, critical, and most importantly, contemporary. They argue the use of IAE is all about power, and it’s about trying to gain insider status in the fiercely competitively art world. In other words, IAE has made it harder for non-professionals. And they suggest a more cynical aspect to IAE; it’s showy vagueness can also be commercially pragmatic: "The more you can muddy the waters around the meaning of a work," says Levine, "the more you can keep the value high." Rule and Levine are cautious about IAE's precise effect on artists; they haven't researched it. But Rule does say: "It would be naive to say artists are not influenced." They are not so sure about the future of IAE. Given the competence in it is so universal among art professionals, it’s losing its allure as an exclusive private language. But rest assured, if IAE does wither on the vine, a new form of art gibberish will surface in the near future. “She looks like a monkey, an aborted foetus. If she were smaller one would be tempted to pickle her in a jar with alcohol.” This is a sample of the vitriol that was hurled at Edgar Degas’ sculpture called “The Little Dancer, Aged 14” that was included in the French Impressionist Exhibition of 1881. By this time, Degas’ reputation as a fine painter was well established. His depictions of ballet dancers were revolutionary in style and composition. After studying the works of the old masters Degas declared he wanted to be the portrayer of modern life. That is exactly what he had in mind with “The Little Dancer”. When one considers his background – wealthy, rather buttoned up, even lonely, it’s remarkable that he should produce a sculpture such as this. So why the hostility? Sculpture at that time was meant to be an uplifting art form, with figures cast in marble or bronze. And yet here we have a figure cast in wax, about 2/3 life size with real hair and wearing a real tutu, and displayed in a glass cabinet which made her look like a scientific specimen. Then there was that pouting expression on her face, it seemed to challenge every assumption the audience made about art; ie, she was not seeking to be admired. Her facial features were thought to be based on “studies” being carried out by anthropologists into where humans stood on the evolutionary scale. People with low, sloping foreheads and jutting jaws were regarded as being more primitive, like monkeys. The model for The Little Dancer came from a poor family and Degas was known to be a misogynist. He never married and had no children. More importantly, this sculpture reminded Parisians of something they didn’t want to know - the goings on behind the scenes at the Paris Opera which contained the ballet school. Certain rooms were set aside at the rear of the school that were frequented by wealthy male patrons and the young ballet students for extra-curricular activities. Some of Degas’ ballet paintings are haunted by men in top hats – the wealthy season ticket holders. Art and prostitution side by side. It’s curious that The Little Dancer has been immortalised by dance students around the world when one considers what happened to Marie Van Goethem, the model for Degas’ sculpture. The Van Goethems were among the poorest families in Paris, the mother took in laundry and the father was a tailor. She was the middle of 3 daughters, all of whom attended the ballet school. Her older sister Antoinette fell into prostitution (aided by her mother) and was arrested and jailed for robbery, and about a year after Degas completed The Little Dancer, Marie’s life also began to unravel. Rumours that she was seen in a bar frequented by artists, dancers and prostitutes were circulating and she began to miss her classes. In 1882 she was sacked. What became of her after then, no one knows but it’s thought she ended up on the streets. The younger sister Charlotte was a success story and was involved in the Paris Opera for 50 years, becoming a teacher. 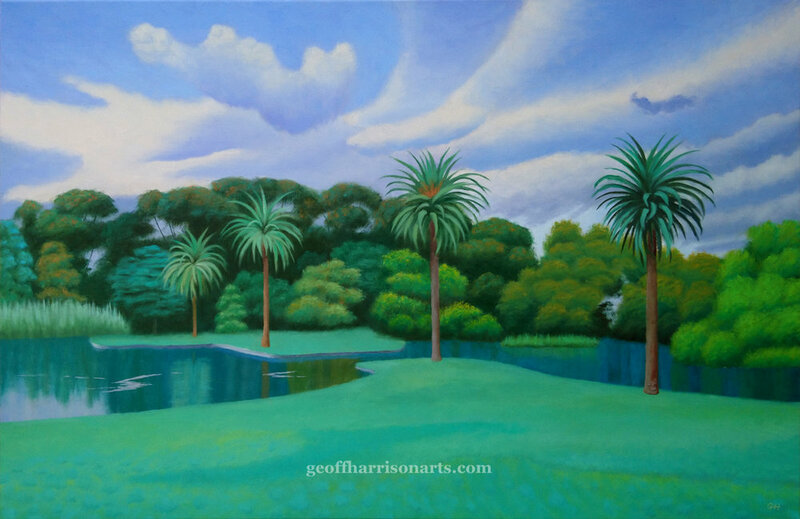 Reference is made in the article to psychologically nourishing landscapes, and that is certainly what I encounter in Melbourne’s Botanical Gardens which have been the setting for most of my recent work. I always feel refreshed and reinvigorated after a visit to them and it’s always a wrench to have to leave. If you want to experience solitude in the midst of the vast city, visit Melbourne’s Botanical Gardens when it’s raining. Some may find the experience melancholic, but it can be a refreshing change from a world obsessed by buoyancy and cheerfulness. With few people around and no annoying sight-seeing aircraft buzzing overhead, one can really discover the mystery of the place, the variety of plant life and the thought that has gone into the landscaping. So, by middle age it is argued, nature can present a “genuine pleasure amidst a litany of troubles, an invitation to bracket anxieties and keep self-criticism at bay, a small resting place for hope in a sea of disappointment; a proper consolation – for which one is ready, a few weeks of the year, to be appropriately grateful.” I can only agree. There have been many times I’ve visited these gardens for palliative care. I came across an excellent article by artist Anne Wallace in the latest NGV mag (Jan-Feb 2019) on the continuing relevance of surrealism, “…surrealism is so beloved because it taps into that deep well of profound alienation from societal norms felt by sections of each new generation.” You see surrealism everywhere on album covers and in advertising generally due to the arresting power of strange juxtapositions. It was Sigmund Freud who first made us aware of the power and uncontrollability of the unconscious mind, so it is not surprising to see Freud’s name scattered throughout the literature on Surrealism. Wallace describes Surrealism as freeing expression from the constraints of rational thought - a liberating project to uncover the workings of the unconscious mind that Freud pioneered. “Surrealism allowed artists to be frankly weird, degenerative and perverse in their obsessions.” Reference is made to Surrealism lighting up “the dark caverns” and artists such as Cindy Sherman and film maker David Lynch are also mentioned. Wallace makes reference to the challenges facing surrealist artists in modern times due to the representational nature of the genre which is seen as anomalous by the avant-guard with its obsession with minimalism, abstraction and a dry conceptualism. Wallace claims that by the time she went to art school in the late 1980’s, painting, and especially representational painting, was seen as passe and an art form of consumption and decor. That is certainly the impression I was under when at art school in the 1990’s. But Wallace believes surrealism “continues to be relevant not as a kind of kitsch aesthetic to be appropriated but as a kind of philosophy, a destabilizing principle, the invisible worm that corrupts our notions of normality……artists should be allowed to be obsessive, to pursue the enigmatic, to experiment - this is the philosophy of Surrealism.” Here here to that. While studying art at RMIT University in the 1990’s I felt a not-so-subtle pressure to steer clear of sentimentality and emotional subject matter in my art practice. I’m not sure why emotion was so frowned upon, a sign of the times perhaps but there was a clear preference for dry, conceptual work. Thus I often felt alienated at university, and I do recall a presentation given by one of the lecturers who was most adverse to emotion in art. It soon became clear to me that she was in denial – almost in denial of life, so I formed the opinion that this issue of emotion was her problem, not mine. I was reminded of all this when viewing Andrew Graham-Dixon’s 1996 series “A History Of British Art” on DVD. He argues that because of their intense colour and blatant sensuality, Howard Hodgkin’s paintings (above) have met with an uneasy response in Britain. He describes Hodgkin’s work as a rebuttal to puritanism, especially to that intellectual puritanism which is embarrassed by pleasure or any form of strong emotion and are only comfortable with pictures once they’ve been reduced to a set of abstract ideas. He describes Hodgkin’s work as expressing a language of emotion, a language of the body. And for some reason, a drawing by Vincent Van Gogh, made early in his career, also came to mind. The subject is Sien, one of his early mistresses who was a pregnant prostitute. You can see the emotion pouring out of this work. How put-upon I would have been producing a work like this at RMIT, regardless of the technical skill it may have embodied. I need to be moved in some way by a scene before I will paint it. The aim always is to create a mood which allows the viewer to enter the scene and absorb the atmosphere in there. The story of Nadia Chomyn (1967 - 2015) is remarkable. Born to Ukrainian parents who moved to England in the 1960’s , she was diagnosed as severely autistic. She needed help dressing and feeding and was unable to effectively communicate and yet from the age of 3 was able to draw superbly. She broke all the accepted rules of the development of graphic representation in children. That is, she never went through the usual childlike stage of scribble, stick figures etc and was able to draw seemingly without motivation. Once finished she would push the drawing away or draw over it. Her drawings raised questions about the relationship between the conscious and instinctive mind. She was at her most productive between the ages of 3 & 9 and when her drawings were published in 1977, they created quite a stir. She came to the notice of the renowned neurologist Oliver Sachs and her remarkable talent is still frequently cited in textbooks on developmental psychology. Her inspiration seems to have come mainly from picture books, especially the Ladybird series, whose pictures were often based on photographic images. Her drawings show a clear understanding of single point perspective, overlapping and the correct use of proportion. Throughout this period, she was very passive and totally unresponsive to social engagement. From about the age of 9, Nadia gradually lost the ability to draw realistically and eventually her drawing ceased completely. Whilst there have been other autistic artists and savants identified and studied over the years, none have shown such a prodigious talent at such a young age.